How much snow did we get? I'm standing at the south east corner of my house, facing the shed. Normally, the snow blows away from here... See the thing behind the chimney? That's my heat pump... Yes, my heat pump got buried under the 45 cms of snow that we had on Sunday. 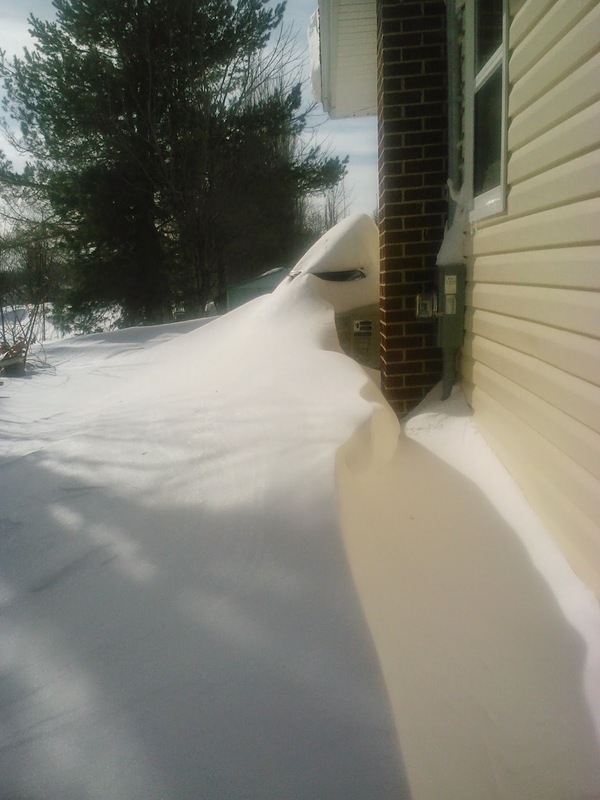 The winds were very high too, creating a lot of drifts. Way in the back, you can just barely see my shed. The fences? Buried? One of my bestest friends came over this afternoon and helped me dig it out. Yep, I waded through the snow and we dug down over 6 feet to get to the bottom of the heat pump. Thank goodness it's warmed up some. I've got the heat pump turned back on, and I'll wade through the snow again later on this afternoon to check it out and make sure that it's working ok. I booked off work this for tonight, as I'm played out. I probably should have taken this week off too, but I'll do my best and go when I feel up to it. I did have a major case of the crankies earlier today, but I dusted myself off, got dressed and walked the dogs. It was so nice to walk them with out tons of layers on! The added bonus to the walk? I hit a section where some pine limbs were recently cut... Oh, the smell was divine. I stood there for a minute, with my eyes closed, breathing in that wonderful scent, with the sun shining on my face. The sun is getting warmer, and I know spring will be here soon enough! That minute of pure joy was heaven sent today! Another added bonus for today, was my friend who came to help dig out, brought me a coffee! I offered her and she accepted, my Wii... I don't use it, and she loves netflixs, and has an older style tv, so it's a win/win for both of us! One less thing taking up space in my house!